I took my foldable electric wheelchair solo on my trip to Philadelphia this week. 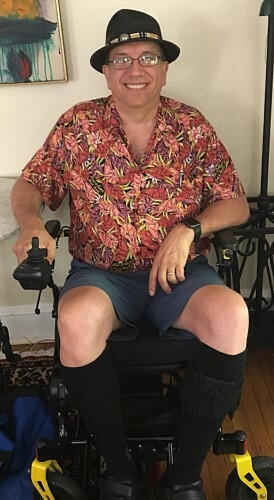 My last solo wheelchair experience was in New York City in 1977 when I took a course at NYU’s Rusk Institute of Physical Rehabilitation. On the second day of the two-week course, I spent the whole day in a wheelchair by myself. It was terrifying. I got stuck in a pothole crossing Fifth Avenue during rush hour. The ground rules were, never get out of the chair. A homeless woman ran over and pushed me across before I got run over by the honking yellow cabs. On Tuesday, in Philly, I got stuck again in a small sidewalk pothole and a man, sitting on the curb with an “I’m homeless” sign came over and pushed me out. I saw him again on my way back from the restaurant. I handed him $10 and thanked him for helping me. He wouldn’t take it, I was just helping you out. I thanked him again and told him, you helped me and now I’m helping you. He took it. I noticed while motorizing along that I made more eye contact with people sitting on curbs or steps than people walking and standing. A sensation I remember when sitting on the floor against the wall in the lobby at Children’s Hospital Boston – eye contact with kids in strollers. A different and rich perspective. Accessibility is proving challenging. While most curb corners have cutouts, many have holes and cracks that catch my small front wheels and some aren’t at the corner so a car will be in the way when I’m trying to cross at the light. The restaurant we ate at one night had steps to the event room and I was taken in a service elevator. The service side looks much different than the public side in an old building. I saw a dusty very old payphone leaning against a wall. The hotel I stayed at was quite accessible except the front door was only a revolving door. Imagine a comical scene: they put the speed for the door to slow, I drove in the quarter section just fitting, but couldn’t really advance forward because I hit the glass and stopped the rotation. They manually pushed me around. I found the valet parking exit which was accessible. I’m only a fair driver, but I didn’t run over anyone or bump their shins. Defensive driving is as important in wheelchairs as cars. Many cafes and bars had outdoor seating, lines, and wait staff. Took some emphatic excuse me‘s to clear a path. The airline was great. I could drive right to the plane door, fold the chair, and someone took it and returned it when we arrived. Doors and sharp turns are tough. Do I push through with my feet? What about pulling a door open and getting through? Don’t ask me about bathroom adventures. This mobility enhancer has its own quirks. Thank God for helpful people – of all stripes. They’re everywhere, they’re everywhere. Wow Danny, thank you for helping all of us walking around have this wheel-chair view of our city streets, hotels, etc. I’m grateful you’re finding so many helpful people wherever you go! Thanks, Sue. I’m actually doing very well. I’m trying to figure out how to do more. I’m still doing my 3,500 step a day minimum, but Ann does at least 10,000 and I want to keep going with her and not get dropped off after my limit. The chair allows me to keep going. I have been able to manage less and less site seeing. The chair helps with that. I fall more when my legs are tired. Hopefully, less falling. We’re planning a trip to Quebec City in October and Spain in May. We’ll see how the chair works there. I’m triking still.